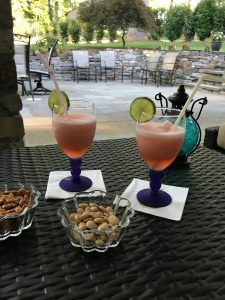 I had my first taste of a frose’ cocktail at Estia Restaurant in St. David’s, PA on July 4th! They have a giant professional frozen slushy type machine that dispenses these magical frose’ cocktails! Not having the counter space in my own kitchen for this type of unit – I asked what the basic ingredients were and set out to recreate them at home: Rose’ wine, strawberry simple syrup and lime juice. I did a little searching online and saw lots of recipes that call for pouring the rose’ wine into a baking dish and freezing in advance. …hmm…I didn’t plan ahead for pre-freezing the wine a day ahead, so went ahead and blended in lots of ice. This first batch I tried out with my girlfriend, Courtney. They were very tasty, but didn’t really pack much of an “adult beverage” punch as the wine was diluted by so much ice. The next time I added some vodka and tested them out on my husband and our friend Robert – and we had a winner! Yum!! I even toted my KitchenAid High Performance Blender to our Picket Post Swim Team Banquet and made a bunch of batches to share! You definitely want to use a good high powered blender to get that smooth, thick texture. Cheers! 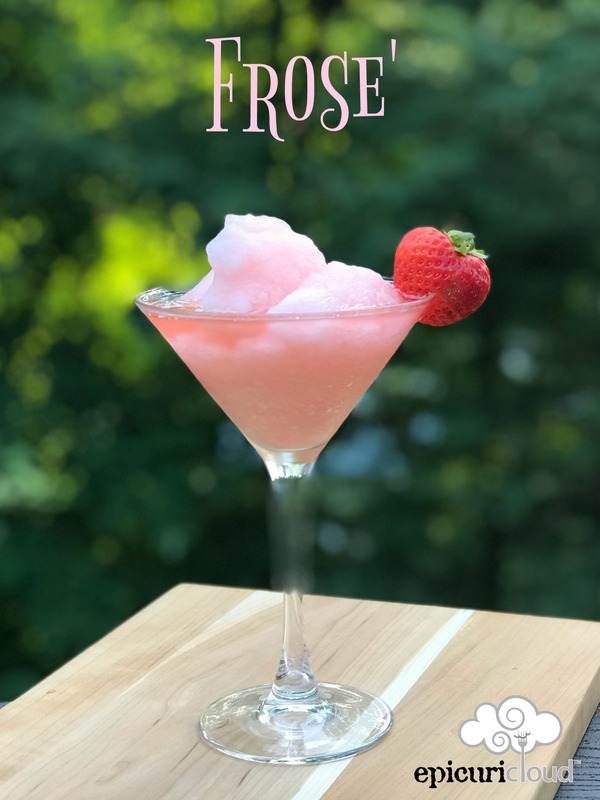 You'll enjoy this beautiful and refreshing frozen cocktail all summer long! It combines rose' wine, lime juice and strawberries! This recipes makes 2-4 cocktails depending upon the size of your glass. You can easily multiply this for more. Note: You'll need to make a strawberry simple syrup, make this a few hours in advance so it will have time to chill. Make and chill strawberry simple syrup a few hours in advance: In small saucepan over medium-low heat, stir together water and sugar until almost a simmer. The sugar should be completely dissolved. Turn off the heat and add the chopped strawberries. Let them steep and infuse the syrup for 3o minutes. Strain and chill the strawberry simple syrup. Add 1/2 cup chilled strawberry simple syrup, 1/2 cup rose' wine, 1/4 cup vodka and juice of half a lime to your blender. Add ice and blend until smooth. Pour into glasses, garnish with strawberry or lime slice. They're nice to drink with a straw too. Sometimes I'll cut the straws in half if they're too tall for the glass. Cheers! Happy Summer! EPICURI: Foodie, passion for food and drink. Love to share my recipes here! Join me! In this corner of the website I’ll post News, an Airing Calendar & Links to Demo Recipes! 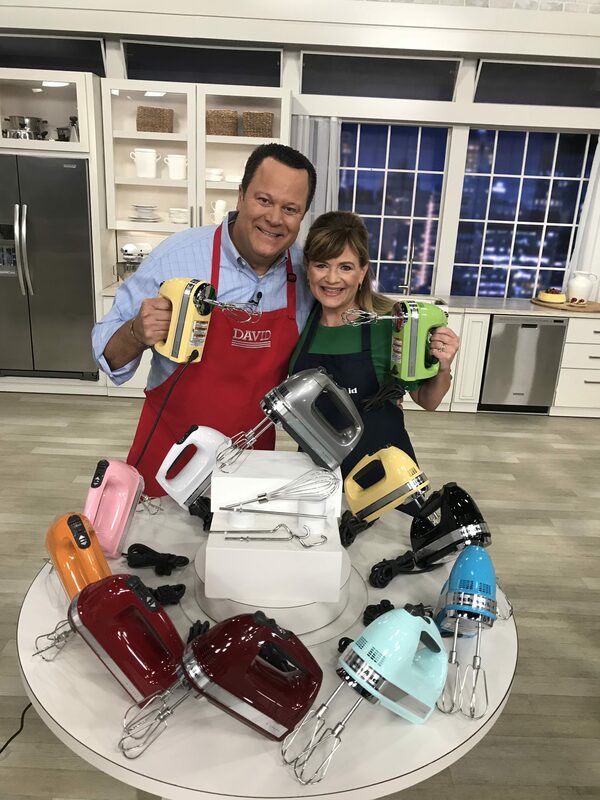 KitchenAid on QVC Semi-Annual Celebration Kicks Off on 2/17/19 Join us!